I have a confession to make. Sometimes, I skip my active warm-up exercises when I workout (kind of). We are all guilty of it (admit it). 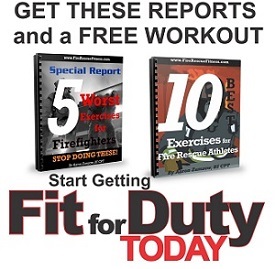 Let’s face it, sometimes you hit the gym or the workout room in the firehouse and are tired or short on time and will “sacrifice” the warm-up and stretching. I do not recommend EVER skipping your warm-up. If you have read my posts in the past you understand how important the active warm-up and flexibility portions of the workout are. Need a refresher, click here for a great post about active warm-ups and flexibility. A warm-up should do two things: loosen muscles and tendons to increase the range of motion of various joints, and literally warm up the body. When you are at rest, like when you hold a stretch, there is less blood flow to muscle and tendons and they stiffen up. Which is why I recommend performing a dynamic or active warm-up. Dynamic Stretching (active warm-ups or movement prep exercises) are movements through a range of motion without holding at an end point. Dynamic stretching avoids bouncing motions and tends to incorporate more sport-specific movements. This form of stretching prepares the body for physical exertion and sports performance. Dynamic stretching increases range of motion through movement and increases blood and oxygen flow to soft tissues prior to exertion. This increase in flexibility lasts more than just through the workout and can transfer to improved performance, more efficient movement and reductions in injury.